In clinical trials of antidepressant treatments, a depression rating score is usually measured at several points of time for each patient. We propose an approach to fit data from this type of clinical trial using an exponential mixed-effects model. Compared to previous proposals, this approach has the advantage that individual recovery curves are fitted rather than curves of means. Furthermore, no artificial fixing of model parameters is needed as in other approaches. The flexibility of the proposed model is shown for various situations. The approach is illustrated by an example from a placebo-controlled study for the treatment of depression with St. John’s Wort (Hypericum perforatum). 1 Hamilton M. A rating scale for depression. J Neurol Neurosurg Psychiatry 1960; 23: 56-62. 2 Priest RG, Hawley CJ, Kibel D. et al. 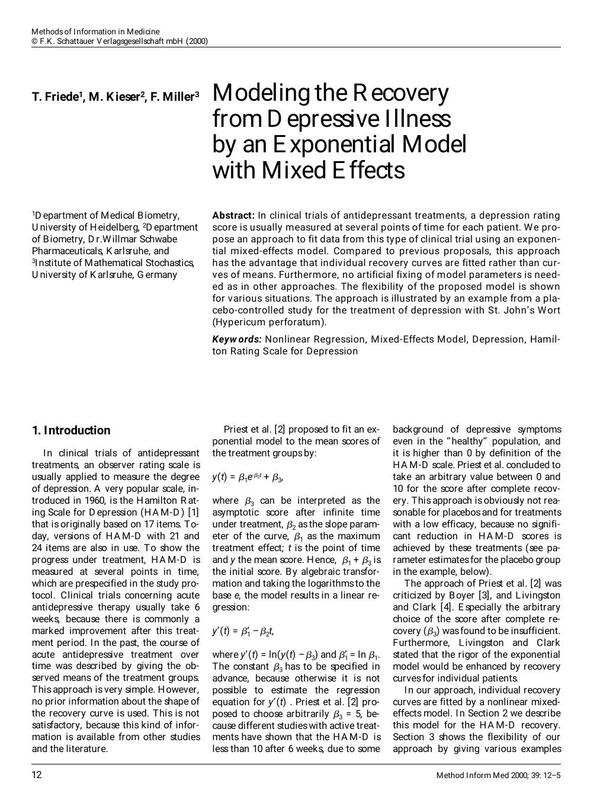 Recovery from depressive illness does fit an exponential model. J Clin Psychopharmacol 1996; 16: 420-4. 3 Boyer W. Antidepressant response follows an exponential decay curve: replication and extension. J Clin Psychopharmacol 1997; 17: 426. 4 Livingston MG, Clark A. Curvaceous model of recovery from depression. Lancet 1997; 349: 447. 5 Lindstrom MJ, Bates DM. Nonlinear mixed effects models for repeated measures data. Biometrics 1990; 46: 673-87. 7 Gill PS. A note on modelling the covariance structure of repeated measurements. Bio-metrics 1992; 48: 965-8. 9 Wolfinger RD. Comment: Experiences with the SAS macro NLINMIX. Statist Med 1997; 16: 1241-62.